Antonio Conte was reluctant to discuss the departing Diego Costa on Friday, but suggested Alvaro Morata would benefit from being more like his predecessor as Chelsea's leading striker. 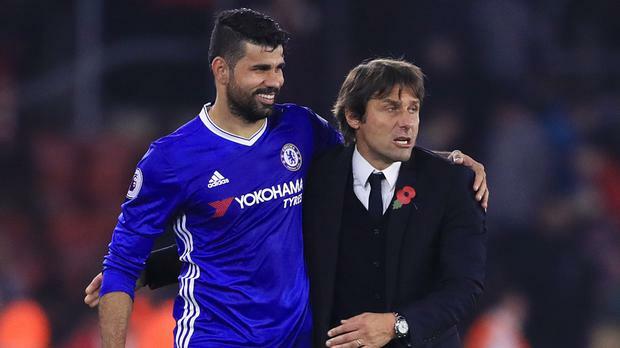 Chelsea head coach Conte thanked Costa for his contribution - 59 goals in 120 appearances, two Premier League titles and a League Cup win - during his three years at Stamford Bridge. But that was as far as he was willing to go after it was agreed on Thursday that the 28-year-old Brazil-born Spain striker would rejoin Atletico for a reported fee in the region of £58million. Asked about his replacement Morata, who has scored three goals since joining from Real Madrid in the summer, Conte was more talkative. Conte reckons "very polite" Morata can be more aggressive on the field, an aspect of the game Costa relished. "I like him (Morata) because he's a complete player and also he has a lot of room to improve in every situation," Conte said. "When I speak about a lot of room for improvement it also means this aspect, to be more (aggressive)." Conte described Morata as the type of person a father would welcome with open arms if the 24-year-old were to come home with their daughter. A smiling Conte stressed he was not talking about his own daughter Vittoria, who is not yet a teenager. "If you have a daughter you hope for this type of person (to be) with your daughter, to marry your daughter," said Conte, who also praised Morata's goalscoring instinct. "He's a good finisher, he feels the goal in every moment." Costa's public reputation as arch-antagonist contrasts with his private one and he was popular behind the scenes at Chelsea. Despite Costa's Chelsea career ending in acrimony, Conte insisted he would shake hands with the striker in future. "I have no problem," Conte added. "We want to thank him for what he did with this club. We wish him all the best for the future. "I'm not interested to continue talking about this issue. There is a lack of respect for my players because Diego is an Atletico player." Chelsea play at Atletico next Wednesday in Champions League Group C, and all parties will be relieved the matter has been resolved. With Atletico under a transfer embargo and unable to register new players until January, Costa will have to wait to wear the red and white stripes again. The deal is initially a loan until the end of the season with a commitment to buy. Chelsea play three games in eight days, with the Atletico game between Premier League fixtures with Stoke and Manchester City. Only midfielder Danny Drinkwater (calf) and defender David Luiz, who is suspended domestically and has a broken wrist, are absent against Stoke. Playmaker Eden Hazard is set to start in the Premier League for the first time this season against a Stoke side who have already beaten Arsenal and drawn with Manchester United at home this term.